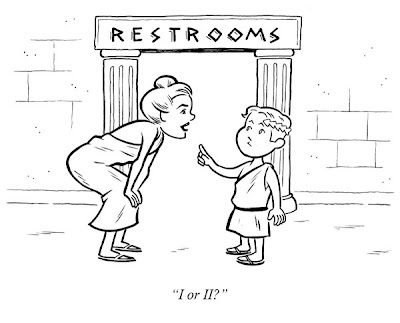 Here's a couple rejected attempts at New Yorker cartoons. 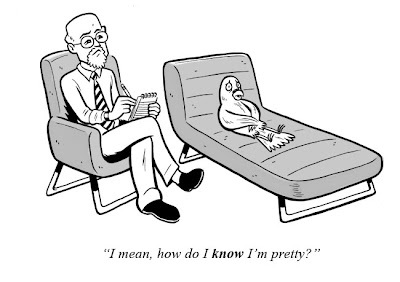 I thought they'd print anything that had a psychiatrist's couch in it, but I guess I was wrong! I languished on the couch all last week, locked in pitched battle with a painful abscessed tooth. As anyone whose ever had an abscess tooth will tell you, it hurts like nothing else, and pretty much demands the use of high-powered painkillers. 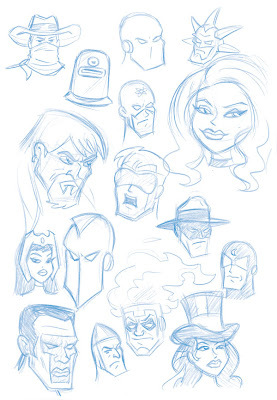 I groggily watched hours and hours of Justice league Unlimited, in between drug-induced naps, and at one point, managed to draw these. I've been wanting to post this for days! 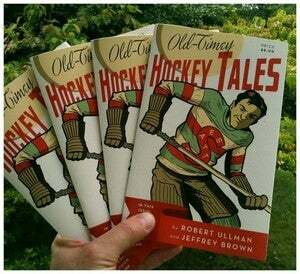 It's from the music column in this week's Brick, where the author explores some of the truly horrible music recorded by holy-rollers like Falwell over the years! 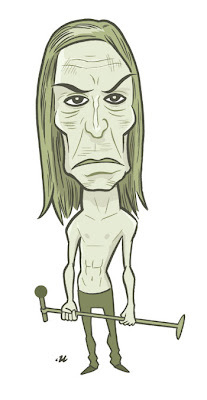 In recognition of the recent announcement that Elijah Wood will play him in an upcomic biopic, here's the Wizard of Ig himself, Iggy Pop, from a recent Brick! Drawn in blue Col-Erase pencil, scanned and colored quickly in photoshop. It'd probably look better if I'd skipped the color. The backyard reclaimation project continues. I dug out the earth and set the path yesterday afternoon, and today once my illo work is done, I plan to fill the gaps with dirt and topsoil and add a little grass seed. All of this sould happen just in time for the thunderstorm and hail we're supposed to get this evening. ugh. 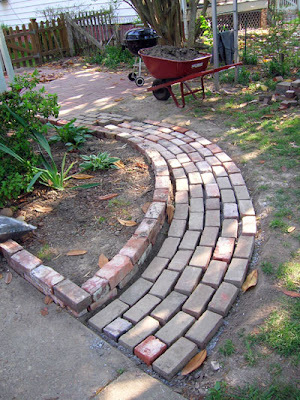 I also recently built that little brick wall that's flush with the path. I think it looks good, but I'm having trouble finding an adhesive that will hold the bricks together. Any ideas or reccommendations that don't involve me out there with a cement mixer and trowel? 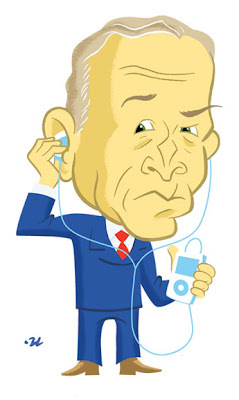 From this week's "Sound Advice" column in BRICK: Our dipshit president reacts to some of the songs that have recently been written about him and his crooked administration. I'd feel sorry for him if he weren't such a bum. 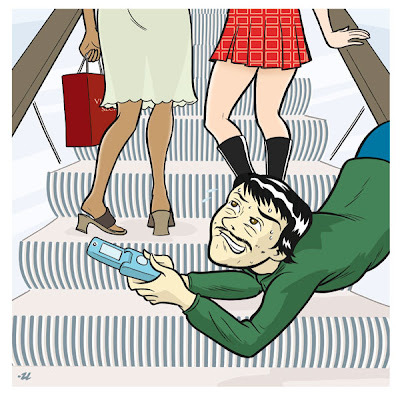 This is for an article in LAS VEGAS WEEKLY, about some mall or casino that had to ban cell phone use on its escalators because of...well, because of this! Conan O'Brien is seldom funnier than when he goes out and interacts with the people. This video is no exception. He might even be able make "Jaywalking" once he takes over the Tonight Show!